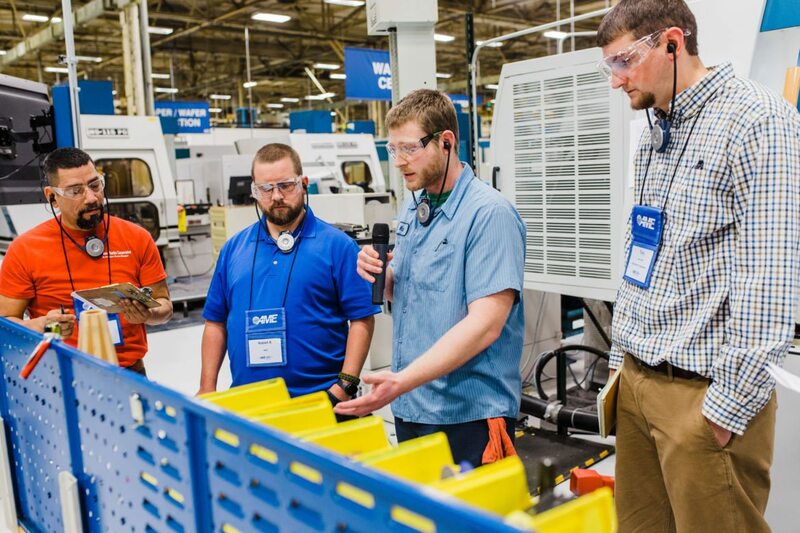 Guests at the recent AME Chicagoland Lean Tours enjoyed uninterrupted tour experiences through loud manufacturing environments with help from Sennheiser 2020 wireless tour guide systems and onsite event support provided by AME member organization TourGuide Solutions. The hands-on tour series featured visits to four Northern Illinois companies over the course of two days in December 2017. The hosts demonstrated how their companies deploy and sustain lean and enterprise excellence at Acme Alliance Die Casting in Northbrook; Gleason Cutting Tools in Rockford; United Conveyor in Waukegan; and G&W Electric in Bolingbrook, Illinois. The Sennheiser 2020 audio system, which is the only completely wireless system on the market, provided exceptional sound quality with multiple channels that allowed up to six simultaneous tour groups. The system’s easy setup enabled each tour guide to hand off their wireless, hand-held microphone to presenters at each station of the tour. Each tour guide, station presenter and guest had their own wireless stethoset receiver, with the guests’ receivers programmed to correspond with the microphone assigned to their group. This simple setup allowed tours to flow smoothly, with no delays to adjust equipment at each station. The result were first-class tours in which the leaders and station presenters could provide clear communication for the benefit of their lean manufacturing peers. The Sennheiser 2020 system virtually eliminates the noise, safety, and movement challenges that otherwise are common when leading people through a manufacturing facility. TourGuide Solutions also provided Sennheiser 2020 systems for tours associated with the AME International Conference in Boston in the fall of 2017. The Sennheiser 2020 system also came in handy during the brief tour stops that occurred within quieter office settings. A common misconception about wireless tour guide audio systems is they make sense only in noisy settings. However, the tour leader’s ability to communicate effectively using the hand-held mic enabled them to speak without raising their voice and with minimal distractions for office staff. The system features lightweight headsets with individual volume controls, and the sensitivity setting on the wireless microphone enables the presenter to diminish background noise and deliver crystal clear audio. Tour leaders did not have to strain to be heard despite the fact their audience often stood at varied distances in loud environments. Guests remained focused on the presenters as they described how lean practices are implemented into operations to decrease cost and increase productivity, along with descriptions of the techniques they use to track, document, and report their results.